This blog entry has gone under several revisions. Last updated 02/06/2018. Yes you read right, this isn’t clickbait. The First Century Manuscript of the Gospel of Mark that Dr. Daniel B Wallace told the world about during a debate in February 2012 with Dr. Bart Ehrman has, finally, been published. The debate is here. The following month, in March 2012 Dr. Wallace doubled-down on his assertion that a probable first-century manuscript of Mark had been found on this blog post. The manuscript in question has now been published in Oxyrhynchus Papyri Vol 83, officially designated as P.Oxy LXXXIII or 137 (Papyrus 137), and the publisher Egypt Exploration Society (EES) has put up this page on their website about the manuscript. The authors of the publication of 137 is Dr. Daniela Colomo and Dr. Dirk Obbink. At that same link they have now provided the full article on P.Oxy LXXXIII 5345 as well. Dr Wallace has not been the only evangelist raving like mad about the discovery. Two months prior, in November 2011, on Twitter Dr. Scott Carroll had announced that there was a manuscript that is earlier than the John Rylands Papyrus. Two years later at a conference in 2014 Dr. Craig Evans was raving like a fundie maniac about it! Significantly, in this video Dr. Craig Evans clearly says the manuscript came from a mummy mask and that it dates to the 80’s AD. Dr. Gary Habermas earlier this year, in February 2018 said that the Mark fragment dates to 80-110 AD. The source of this image is Oxyrhynchus Papyri Vol 83. The full text of the article provided by ESS is here. Copyright 2018 Egypt Exploration Society. As you can see, it turns out that 137 is not first century after all, but late 2nd-early 3rd century. Also it’s a tiny scrap of papyrus containing just 28 Greek letters. It’s a fragment, not a manuscript. This makes it only the second fragment of Mark that dates to the 3rd century – meaning there’s a 50% chance this is the earliest “manuscript” of Mark that has been catalogued. This is not the only surprise. Until now it was commonly believed that 137 was extracted by the Green collection scholars (the Greens) from mummy cartonnage. Dr. Bart Ehrman, and Dr. Roberta Mazza (a papyrologist) have repeatedly criticised the Greens for this. You can also see Josh D. McDowell bragging about the mummy masks on his blog in 2016 where he published this document with some of their “findings” telling his readers to use it for Evangelicalism! We now know this is not the case. 137 is not from the Green collection, and therefore was not extracted from mummy cartonnage. At least that’s what we’re led to believe at this point in time by EES, as well as a tweet from Dr. Mazza (see further down). But it gets complicated because the Greens were not just pulling apart their own cartonnage in an attempt to recover New Testament manuscripts, but have already said they were doing it for cartonnage owned by others as well. And as pointed out above the Greens have already claimed the manuscript came from a mummy mask (Dr. Craig Evans in the 2014 video). However, Dr. Ehrman said in a comment on his blog he thinks Dr. Evans was “evidently completley wrong about that. Not sure why he thought it.” So it’s entirely consistent to think that the Greens extracted the papyrus from a mummy mask owned in the EES collection. Or, Dr. Evans was outright lying in his presentation. The scholars involved with the Green collection (i.e. Craig Evans, Josh D. McDowell, Scott Carroll, Dirk Obbink, Dan Wallace) have a lot to answer for, but it seems the answers we were hoping to get surrounding their mummy cartonnage destruction are not forthcoming right now. That just prior to the 2012 debate with Dr. Ehrman he was urged to break the news about this “manuscript” by its “representative” (probably Dr. Scott Carroll see below). This contradicts the long-running belief that Dr. Wallace had let the information slip accidentally. He says that the information he was given was that a world-class papyrologist had dated the manuscript confidently to the 1st century AD, but that he later found out that at the time he was told this the papyrologist had already revised his assessment. Thus Dr. Wallace is confirming that he has known for years that 137 was not confidently dated to the 1st century. Although Dr. Wallace does not name names, the papyrologist is known to be Dr. Dirk Obbink, who is also the co-author of 137‘s article above (source). He inspected 137 himself in 2012, at which point he discovered it contains the nomen sacrum. This should have clued him in immediately to the reality of this “manuscript”, but he signed an NDA and so he said nothing until now. Although he issued a full and frank apology to Dr. Ehrman, one thing was missing. He did not acknowledge that even if his information was solid that it wasn’t appropriate to use unpublished data about an early papyrus NT fragment in the debate – especially as he had not talked directly to the “world-class papyrologist” who dated it. Although he has issued a full and frank apology to Dr. Ehrman, he didn’t apologise to his website’s visitors and the public at large for his 22 March 2012 blog post in which he confirmed the discovery of a first century fragment of Mark. And then left up for the past six years even after he knew it was wrong because “someone else” told him to. Dirk Obbink offered 137 for sale to the Greens in late 2011 and represented the date as being late first century to early second century. He (Dr. Carroll) told Dr. Wallace about 137. But he says he wasn’t able to “authorise” him to disclose it in the debate. Dirk Obbink was still trying to sell 137 in 2013, still with the same dating. Evangelical Textual Criticism claims that 137 has always been a part of their unpublished collection since it was first excavated by Grenfell and Hunt’s excavation at Oxyrhynchus (c. 1903), and that it was never for sale. Dr. Carroll doubled-down on his claim that it was for sale. There are several questions left unresolved, and several contradictory claims by different stakeholders right now. Dr. Wallace says he was told 137 was confidently dated to the 1st century, and that he was urged to break the news with his Ehrman debate. Dr. Carroll says he was told 137 was dated to the late 1st to early 2nd century, and that he did not ask or authorise Dr. Wallace to break the news. Dr. Wallace and Dr. Carroll both say that by the end of 2011/early 2012, Dr. Obbink had a date range in mind that included late first century or second century. In March 2014, Dr. Evans confidently claims at a conference that it has been dated to the 80’s AD and that date will appear in the publication of the manuscript. In Feburary 2018, Dr. Habermas confidently claimed that it had been dated to 80-100 AD. Evangelical Textual Criticism claims 137 has never been for sale. Dr. Carroll says that Dirk Obbink had 137 for sale and was trying to sell it to the Greens. Dirk Obbink has issued a statement via an article on the Daily Beast saying that he never offered 137 for sale to the Greens. Dr. Evans says 137 was extracted from a mummy mask. EES claims 137 came from an excavation in 1903 and has always been part of their collection. To conclude. Dr. Wallace was, until today, I thought, a decent reputable NT scholar. However, this fiasco has shown the true light of fundamentalist/evangelical NT scholars. And not in a pleasant way. Several of these evangelical scholars have been outright lying, if not all of them. Their conduct has been absolutely shameful. EES may also be lying about where 137 came from. They know that Dr. Evans said it was from a mummy mask in 2014, if this was not the case why didn’t they immediately correct the record? Why do we have Dr. Mazza now self-contradicting; if she knew that 137 wasn’t from a mummy mask why didn’t she correct her previous statements on her blog? It seems we’re going to have to wait until further information comes to light. One thing’s for sure, I don’t think I’m ever going to trust these people again, any of them. Any evangelical scholar that knew anything about this. They intentionally lied and mislead the public and their academic peers. 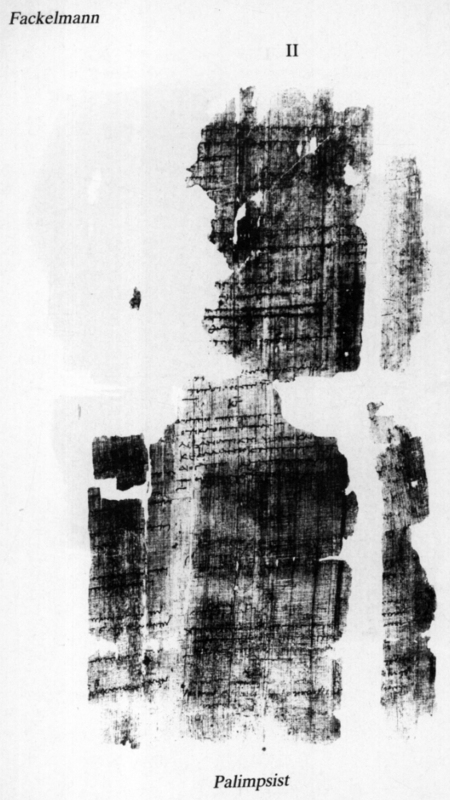 It turns out that this is not the first time a scholar has found a papyrus fragment that he claimed was from a First Century manuscript of Mark. Incredibly there was another claim to a fragment made by a scholar named Michael Fackelmann, and unlike P.Oxy LXXXIII 5345 the first century date made it into an academic publication! And not just that, but the manuscript was also recovered from mummy cartonnage! What are the odds right? This fragment is pictured to the left. You can learn all about it on Dr. Brent Nongbri’s blog in two riveting posts (post 1, post 2). He did some pretty impressive detective work, the kind usually reserved for investigative journalism – yet Brent is a New Testament scholar who specialises in, you guessed it, papyrology. He has of course also put up a blog post about P.Oxy LXXXIII 5345. Of course Fackelmann’s assessment has not stood the test of time. But, I don’t want to spoil the story of Fackelmann’s fragment, I highly suggest reading Dr. Nongbri’s blog. It’s excellent. The premature announcement regarding the dating of this fragment had one purpose: To win a debate against Bart Ehrman. The fact that this misstatement has not been corrected for six years deserves a full investigation. Even if the original autographs of the Gospels were discovered, what would it prove? The overwhelming majority of NT scholars do NOT believe that eyewitnesses nor the associates of eyewitnesses wrote the Gospels. Even scholar NT Wright has said, “I don’t know who the authors of the Gospels were and neither does anyone else”. Therefore, we do not know if the stories told in the Gospels are historical facts or literary embellishments, embellishments perfectly acceptable in the genre in which they were written—Greco-Roman biographies. The days of Christians using the Gospels as primary source documents to support Christianity’s supernatural claims are over. The discovery of first century fragments of copies of the Gospels will not change that. You must not be around many fundamentalists because it will NEVER be over for them. I’m around them from time to time and trust me, they don’t rely on historical facts. I completely agree with your assessment of Wallace, Evans, Carrol and Habermas. But there is no evidence that she “confirmed” the mummy mask rumor. In the Mazza post you link to, she was merely reporting what Craig Evans had claimed about the manuscript. And the point of her entire post was that evangelical apologists like Craig are passing on pseudoscholarship and destroying mummy masks in the process. As far as the particular manuscript goes, she was only passing on someone else’s report – not confirming it. When she later tweeted the fact that the papyus was part of the EES collection, it was because the EES scholars had finally confirmed it. Mazza did nothing wrong here. On the contrary, she is one of the few scholars calling out these apologists for there shoddy handling of artifacts and data. Yes I agree Dr. Mazza did nothing wrong, I hope it doesn’t read as if I was saying she did. She did however take Evans at his word that P137 came from mummy cartonnage and would be published by Brill, and used that to confirm its alleged origins. In her tweet she states categorically that the manuscript has always been part of the EES collection. No EES manuscripts are published by Brill, so the question remains how can she be so confident that the fragment has “always been part” of that collection when she appeared to be quite confident before publication that it was in fact part of an entirely separate collection? That is to say, how do we know that Dirk Obbink didn’t fraudulently invent P137’s provenance? I see no reason why we should trust Dr. Obbink and EES when they were in the position to clarify the matter for years, yet they did nothing. Dr. Mazza wishes us to believe these are trustworthy entities. I’m not convinced… I think they did try to sell P137 to the Greens, and if they were letting the Greens claim their story about its provenance right up until publication it tells me we can’t trust their claimed provenance story either. Aractus, you appear to have missed the statement from EES that they only became aware in 2016 that the claimed ‘First Century Mark’ that was the subject of so much speculation was the one and the same as the 2nd/3rd century papyrus of Mark in their own collection. It was only then that they engaged Dirk Obbink to expedite the publication of that fragment (as P137) in the Oxyrynchus Papyrus series. Which is exactly what happened. So there is no contradiction between the views Roberta Mazza expressed before 2016 – on the ethics of extracting papyrus from mummy cartonnage; and the views she expressed recently (as a trustee of the EES) that P137 had never been for sale, and had always been part of the EES collection. The EES did not ‘do nothing’ when they discovered that their papyrus had been falsely represented as being for sale – having been falsely described as much older than it was; on the contrary they arranged full academic publication as soon as feasible. This would however necessarily take a period of years to do; as each volume of the OP series includes a considerable number of fragments – which will have been edited by a range of authors. Certainly someone had obtained a copy of Scott Carroll’s photographs of the fragment (EES imply that these were taken when Carroll and Obbink discussed a loan of the fragment to the Greens for the purpose of an exhibition in the Vatican in Easter 2012). But clearly the person doing so was not the EES (Roberta Mazza assures us) and hence can not either have been Obbink – EES would immediately recognise any announced sale as corresponding to the pictures of P137 in their own records.